Apple has released a Verizon Carrier Update for the iPhone to fix an issue which could cause your device to use cellular data while on Wi-Fi. 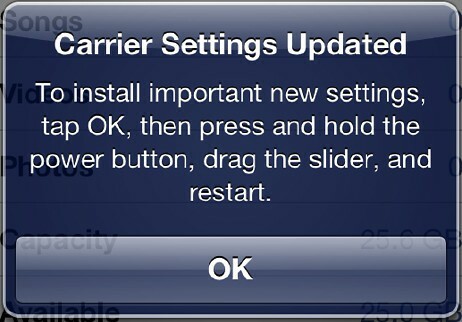 This carrier settings update resolves an issue in which, under certain circumstances, iPhone 5 may use Verizon cellular data while the phone is connected to a Wi-Fi network. Follow these instructions to install the update. ● Tap Settings > General > About. ● Tap OK to install the update. ● Hold the Sleep/Wake button down until you see "slide to power off". ● Slide to power off. ● After the device powers off, hold the Sleep/Wake button to turn your phone back on. Note: To finish the installation of the update, your iPhone 5 must be turned off and then on again. After your iPhone restarts, tap Settings > General > About, then scroll down to Carrier and verify that "Verizon 13.1" is displayed.